Truffles made from Oreos? Customizable by rolling them in your favorite toppings? I can’t imagine this wouldn’t do well. 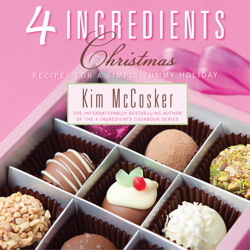 From 4 Ingredients Christmas: Recipes for a Simply Yummy Holiday by Kim McCosker. Line a baking sheet with parchment paper. In a food processor, grind the cookies to a fine meal. Add the cream cheese and blend until well combined with no traces of white. Use a teaspoon to scoop out portions of the mixture. Roll into balls, place on the baking sheet, and refrigerate for 30 minutes. In a medium microwave-safe bowl, melt the chocolate, stirring every 30 seconds, until nice and smooth. Using a fork or two teaspoons, dip the chilled balls one at a time and coat thoroughly; drain excess chocolate. Place back on the tray. When all are coated, refrigerate to set.